Obituary for Jessie E. (Betty) Engan | DellaVecchia, Reilly, Smith & Boyd Funeral Home, Inc.
Betty Engan, 92, of Wellington Hall, West Chester, PA, died on Tuesday, September 4, 2018. Betty lived a vibrant and active life until suffering a major stroke one month ago. Betty grew up as a farm girl in Pike, New York where she attended local schools. She went to the University of Rochester for nursing school, graduating with a BSN in 1948. It was at the U. of R. that she met her future husband, William L. Engan. Bill and Betty were married in Pike, NY in July of 1949. Bill worked as a chemical engineer for the Dupont company all of his life, until retirement, and he passed away in 1986. During their life together, they lived in New Jersey for ten years, where all six children were born. The family then lived in Tennessee for nine years, before moving to West Chester in 1968. Betty worked as a hospital nurse for two years after graduation in New York and in New Jersey before her first child was born. For most of her married life, Betty’s primary focus was to care for her large family and her home. Betty completed a nursing refresher course in 1967 in Tennessee and after the family move, she completed one year of working at Ridley Hospital. Betty then became a nursing instructor for Chester County Hospital School of Nursing for 16 years and also completed her Masters in Education degree during this time. She retired in 1985 to care for her husband when he became ill.
Betty was very committed to serving others in many capacities in the community and in her church. She had a lot of energy and was willing to work hard! She served in areas such as the Westtown Auxiliary, the League of Women Voters, and the Chester County Hospital Auxiliary. 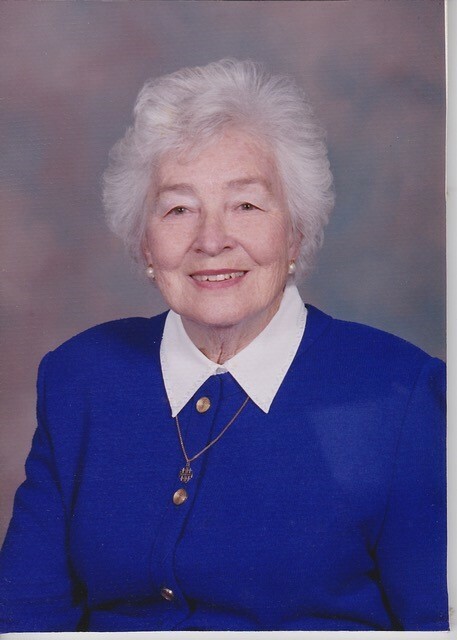 As a longtime member of The Church of the Holy Trinity, she was active in various ministries over the years: leadership in the women's group; several terms of being on the vestry; the altar guild; a lay reader; a weekly sewing circle; helping with the Friday Night Supper" outreach program; serving in the food pantry with the ACT in Faith of Greater West Chester; and simply helping out wherever there was a need. Betty was very proud of completing a four year program called Education for Ministry (EFM), an intensive theology course of study through the Episcopal church. In addition to her service, Betty's main interest in life was her family. She enjoyed researching family genealogy and sharing information on family history. She loved to have all of her large family gathered around at the holidays and for celebrations of birthdays, graduations, weddings. She was a firm believer in higher education and made sure to provide assistance for each of her grandchildren in the college years. She continued to be a life-longer learner herself, participating in enrichment courses of interest to her. Betty had many long-term friends, even from high school and college days with whom she kept in contact faithfully. She was grateful for the many good friendships she developed during the 50 years she lived in West Chester. Betty is survived by six children: David Engan (Joelle), Jean Kolbe (Herb), Karen Pappas (Dean), Ken Engan (Jean), Carol Delaney (Kevin), and Anita Whalen (widow of Gary Whalen); by 13 grandchildren: Kimberly Engan (Jason), Tara Shah (Pratin), Diana Kolbe, Sarah Kolbe (Justin), Marie Pappas, Stephen Pappas (Christine), Kyle Engan (Liz), Katharine Engan (Jeff), Daniel Delaney (Ali), David Delaney (Luvean), Scott Whalen (Camila), Brian Whalen (Chase), Amy Prince (Max), and 3 step-grandchildren: Jordan Carl, Keith Stuart, Melissa Grant (Keith), and 6 great-grandchildren. Viewing will be held at DellaVecchia, Reilly, Smith & Boyd Funeral Home on Thursday, September 6th from 5:30 to 8 pm. A funeral service will be at Church of the Holy Trinity, 212 South High Street on Friday, September 7th at 11 am. Guests are invited to a luncheon in the church fellowship hall after the service. Interment will be private following the luncheon.